Our lawyers have experience and expertise in a variety of corporate and commercial related practice areas. While the list above serves as an overview, it is not possible to capture the full scope of our expertise and services as broad practice areas. We invite you to contact us to arrange a discussion so we can understand your requirements, and share with you our experience and skills that are relevant to your specific needs. 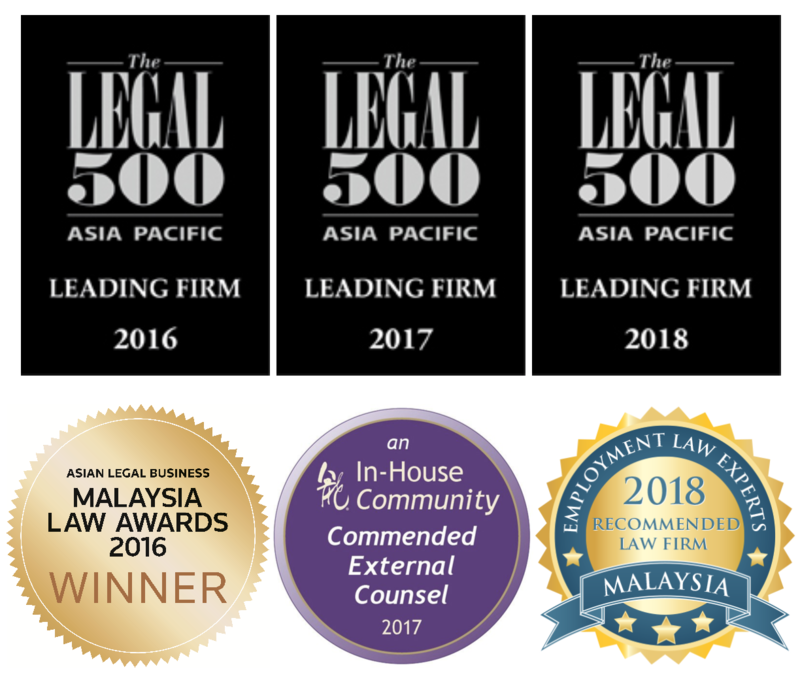 PLVG was recommended by The Legal 500 Asia Pacific 2018 in four practice areas—(1) Banking and finance; (2) Capital markets; (3) Corporate and M&A; and (4) Labour and employment, and was editorially noted for advising on ‘one of the most significant Malaysia-related capital markets deals’ and having an ‘active labour practice’. The ‘very responsive and knowledgeable’ team at PLVG was recommended by The Legal 500 Asia Pacific 2017 in four practice areas — (1) Banking and finance; (2) Capital markets; (3) Corporate and M&A; and (4) Labour and employment, and is also described as “a responsive team that gives practical advice”. The ‘excellent’ team at PLVG was recommended by The Legal 500 Asia Pacific 2016 in four practice areas — (1) Banking and finance; (2) Capital markets; (3) Corporate and M&A; and (4) Labour and employment. Listed as one of Asia’s best law firms for mergers and acquisitions in the Asian Legal Business M&A Rankings 2016. Received the ‘Rising Law Firm of the Year’ award at the Asian Legal Business Malaysia Law Awards 2016. Shortlisted for ‘Boutique Law Firm of the Year’ at the Asian Legal Business Malaysia Law Awards 2017. “PLVG are market leaders in Malaysia, and always update us on current trends and themes that are important for our legal knowledge as regional advisers.